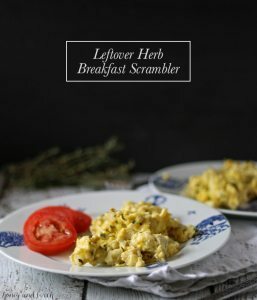 Leftover herbs after Thanksgiving? 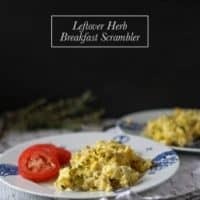 Make this easy leftover herb breakfast scrambler! Perfect way to cleanse after a hearty holiday dinner! I have been on a cooking kick the last couple days. Blame it on Thanksgiving or that I blog about food. Either way, Mr. B has been doing a lot of eating. So have his coworkers. Some of the “leftovers” from my cooking spree were fresh rosemary and thyme leaves. See, not only did I make Thanksgiving dressing that had rosemary – I also decided to make a turkey. Yup, a whole turkey. Mr. B has to work on Thanksgiving so we had Thanksgiving early. I made him his own batch of dressing, cranberry sauce. And a 15 pound turkey. I stuffed it with a ton of fresh rosemary, thyme, and garlic. Then I took more garlic and some basil compound butter and rubbed it all under the skin. I left a bunch of the butter/garlic under there so it melted into the turkey meat when it cooked. And then I put more basil compound butter all around the outside. Yum. Our house was filled with the scent of herbs and garlic and it was splendid. When I woke up the next day and found “leftover” rosemary, garlic and herb compound butter in the fridge, I knew I had to use it for breakfast. It was, naturally, the only use for it. 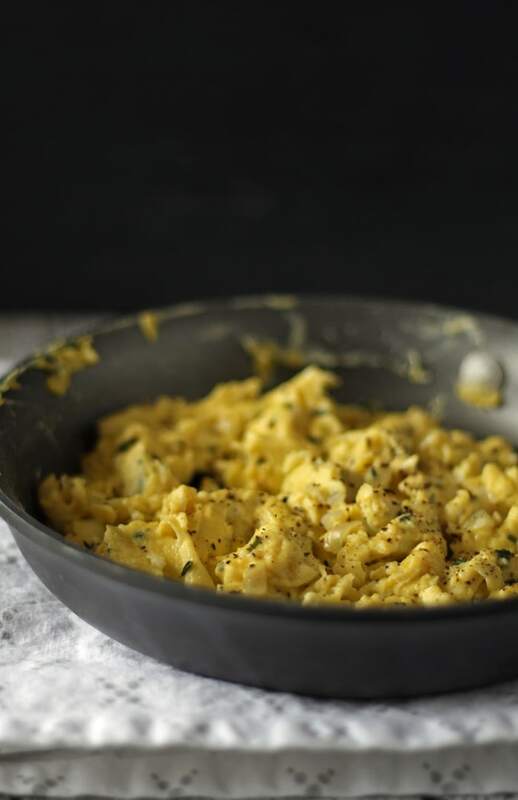 Start with the herb compound butter – it’s very easy to make and you can use a mix of herbs or one herb. My basil plant went crazy over the summer and that’s what I made my compound butter out of. I recommend following this tutorial from Wiliams Sonoma. You can make this in advance – just store it in your freezer and take it out an hour before you need it. After that, gather your herbs. 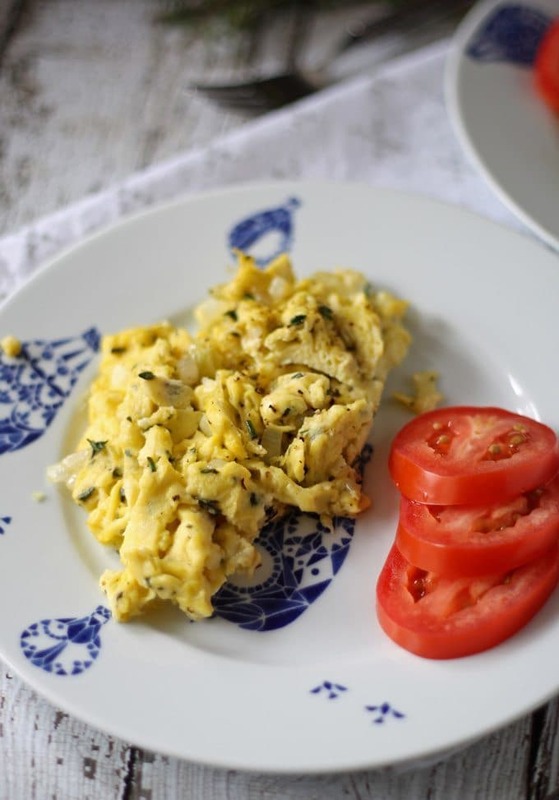 You’ll want 1 teaspoon of fresh herbs for every 4 eggs. I used rosemary and thyme for this recipe, but you can also use basil or sage. I find that after Thanksgiving I have a lot of leftover herbs. Pesto is great and all, but this is so much better. 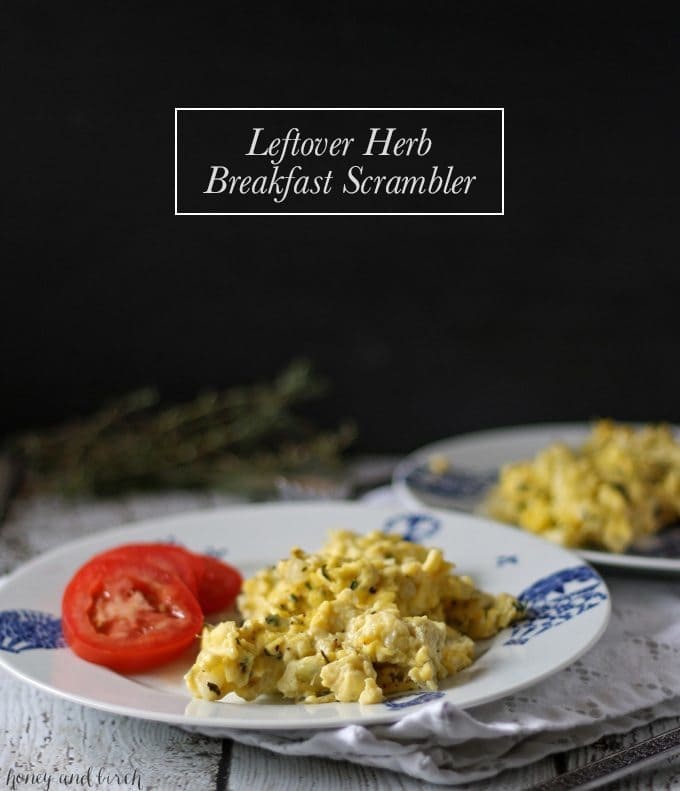 When I make this leftover herb breakfast scrambler, I skip the toast and bacon and eat it with a side of tomatoes. Especially the day after Thanksgiving. Feels like I’m cleansing myself in an eggy kind of way. Melt the compound butter in a small skillet over medium heat. When the butter is melted, add the shallots. Saute until translucent. While the shallots are sauteing, add the eggs and water to a small bowl. Scramble with a fork until well mixed. Add the eggs to the shallots and combine using a spatula. Let set in pan for 1 minute, then add the herbs. 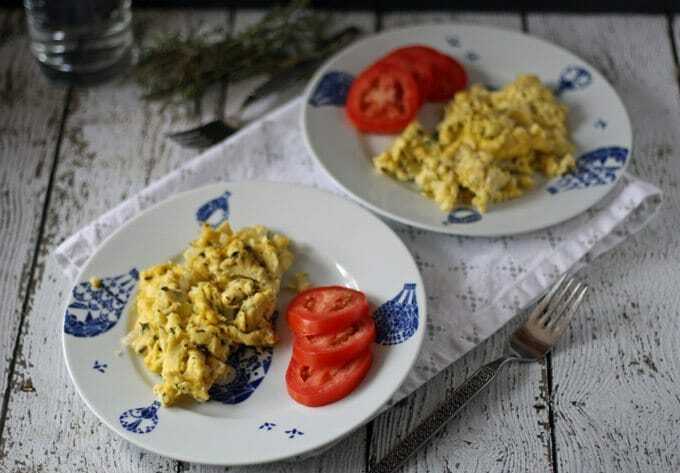 Continue cooking until eggs are cooked through. Add salt and pepper to taste. Serve hot.